Your guess is as good as ours for now. Catholic University has not yet announced who will address the Class of 2018 at its 129th annual Commencement Ceremony to be held Saturday, May 12th, 2018. The lack of announcements, hints, or university communication in general has caused some students to wonder who the speaker might be, and when the secret will be revealed. By comparison, the last four announcements were made March 30th, March 21st, March 30th, and February 11th, respectively. When asked for any information on the matter, the university’s Office of Marketing and Communications responded that the university was still in the process of finalizing the details regarding the commencement speaker and honorary degree recipients. “We should be sending out a notice in the next couple of weeks,” said Jacquelyn Malcolm, Associate Vice President for Marketing and Communications at Catholic. In 2017, the university teased the announcement on March 29th with social media posts hinting at who the speaker might be. Sitting on a couch, President John Garvey, his wife Jeanne, and their dog Gus took a look at an edition of the Wall Street Journal. The post, stating “Stay tuned to cua.edu for tomorrow’s 2017 Commencement Speaker reveal,” encouraged students to guess the speaker and generated some buzz around campus amongst graduating seniors especially. The next day, the university website posted the official article announcing Wall Street Journal Columnist Peggy Noonan as the speaker. What students can probably predict about the speaker is his or her faith background. The university will likely continue its tradition of featuring prominent figures of the Roman Catholic faith. Catholic invited NFL quarterback Philip Rivers to address the class of 2014, suspense novelist Mary Higgins Clark in 2015, comedian couple Jim and Jeanne Gaffigan in 2016, and Noonan last May. All of these speakers, and many before them, are practicing Catholics. Some graduating seniors feel that the announcement should have come by now, and others just hope they get a memorable speaker for the moment. “I’m not concerned about not knowing right now, but I hope they choose someone who is not only aligned with our university’s mission, but who is also an interesting speaker that can really engage with our class and it’s dynamic,” said senior Zanas Talley. As commencement season looms, colleges and universities are announcing their speakers, mostly in February and March, although not uncommon to come later in April as well. 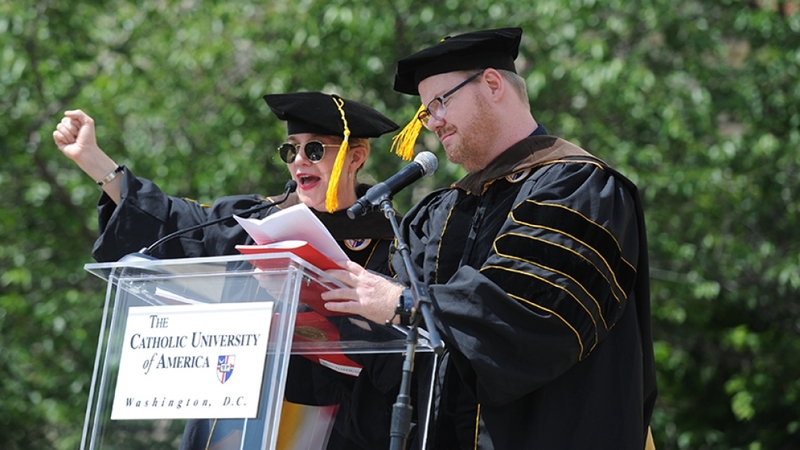 Locally, George Washington University has named Maria McNutt, President of the National Academy of Sciences as this year’s speaker, and University of Maryland at College Park has named former U.S. vice president Al Gore as the speaker for its commencement ceremony in May. Higher Inside Ed, an online publication, posts collected lists of university picks for speakers throughout the spring months. Some notable announcements already made for this year include NYU’s pick Justin Trudeau, Yale’s pick Hillary Clinton, and Dillard University’s pick Chance the Rapper. As decisions that are impossible to please all, a handful of these announcements spark some controversy each year. Whether the speaker is deemed too divisive, expensive, or unaligned with university value, such contention has become something of a springtime staple on campuses. Notre Dame opted to put a hold on its tradition of inviting U.S. presidents to come speak in their inaugural year in office, choosing Vice President Mike Pence as the 2017 commencement speaker instead of President Donald Trump. Bradley University in Illinois decided in 2016 to get rid of the commencement speaker altogether, citing a desire to save time and cut costs. Students have a variety of guesses and hopes as to who the speaker might be. Senior Thomas Doyle has a well thought out guess with his prediction of Gary Sinise as the 2018 commencement speaker. Sinise, most known for his role as “Lieutenant Dan” in Forrest Gump, received the 2017 James Cardinal Gibbons Medal, the Catholic alumni association’s highest accolade, for his creation of a foundation that serves and honors military members, first responders, and their families. His daughter, Ella, also graduated from Catholic in 2015.